To enquire about a business account with us, please fill in the form below and one of our business team will get back to you shortly. Step 1: You will receive an email confirming we have received your enquiry. Step 2: We will check through your details and our business account manager will contact you if we need any more information to set up your account. Step 3: You will be contacted with your log in details to access your account and start enjoying the benefits of being a business account member. Guaranteed Parking: Business account holders always receive priority parking. Guaranteed Low Rates: Up to 60% OFF the gate prices. Staff: Discounts on airport parking can be offered as a staff benefit. One Click Booking: Billing & user details saved for your convenience. Can we pay on account? Yes, subject to the usual credit checks. You can also pay by credit/debit card or paypal. Your payment details can be securely stored on our system. Can our employees book directly? Yes, our software allows for multiple personnel to login and make bookings. Alternatively, if you prefer, you can assign access rights to one member of personnel (e.g your HR manager) who can make the business or personal bookings. All sensitive information can be protected with different user levels. Save time and money (up to 60% off the on gate prices) when booking airport parking. Easy one click bookings with full reporting for accounts. 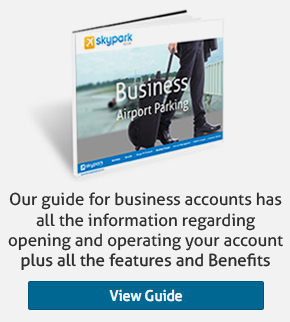 Full coverage at all UK Airports for secure and reliable airport parking.